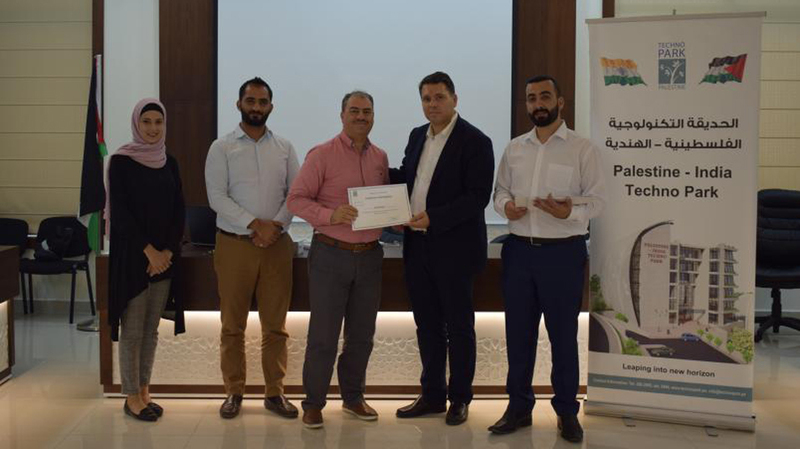 The Palestine Techno Park, based at Birzeit University, has recently held a series of talks and lectures, entitled “Smart Talks - Blockchain,” on the nascent blockchain technology and its importance and applications. Blockchain is a recently-invented technology that relies on an ever-increasing list, or a record, that is shared by all parties. It is implemented in such a decentralized fashion that the record is distributed, and saved, by all participants, with each transaction simultaneously registered by all participants. Led by Basil Abu Baker and Muhannad Amarneh, two renowned blockchain experts with international certificates, the series began with a lecture held on August 27, 2018, at Birzeit University, and was aimed at students from Birzeit, the Palestine Polytechnic University, and Al-Quds University. The second lecture was held on August 29, 2018, at An-Najah National University, and featured students from An-Najah and the Arab American University, as well as university professors and public- and private-sector employees. In addition to the lectures, the Palestine Techno Park has also hosted an intensive training course in blockchain technology. Held on September 2, 2018, the course was attended by entrepreneurs, students, computer scientists and specialists, banking and finance experts, and pedagogical researchers. The course introduced participants to the core concepts of blockchain technology and its numerous applications, and gave them the skills needed to gain employment, or start their own businesses, using blockchain-derived technology. During the course, attendees reviewed current implementations of blockchain technology, such as smart contractsand cryptocurrencies. Being decentralized, the blockchain offers guarantees against tampering or fraud. Any transaction that happens anywhere on the network will be registered and sent to all participants, making it easier to verify the information. Established in 2016, the Palestine Techno Park is a nonprofit organization that supports scientific institutions, entrepreneurial projects, and technology-related organizations. A member of the International Association of Science Parks and Areas of Innovation, the techno park is working to transition Palestine toward a knowledge-based economy and cluster local technology sectors and integrate them with global value chains.